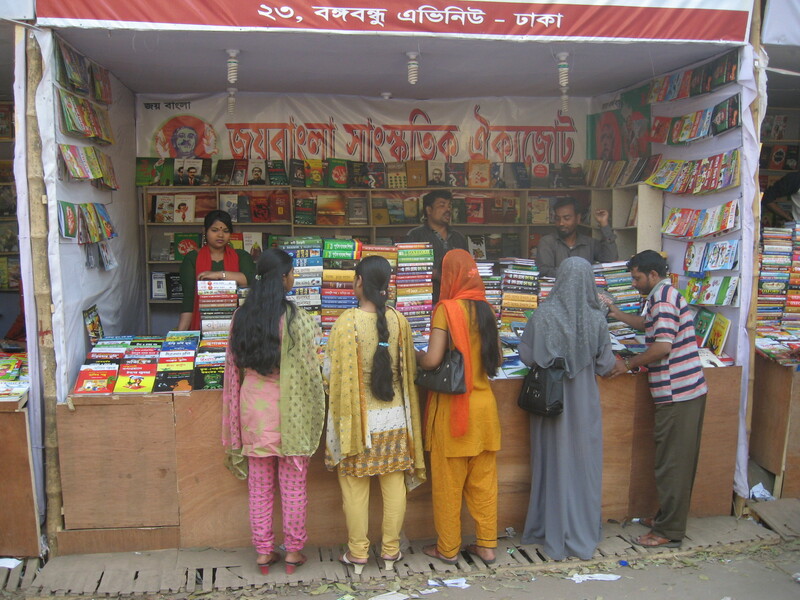 One of the reasons I wanted to visit Bangladesh in February is because I had read about the famous Book Fair that takes place in the grounds of the Bangla Academy every year. Finally visited yesterday afternoon, with Keya from Britto as a guide/translator. Had no idea how big it was! By the time we left at about 5pm, the after work queue was already snaking down the road and the crowds inside were shoulder to shoulder. Amazed to see such enthusiasm for books, considering that until now most of the books I have found have been educational. 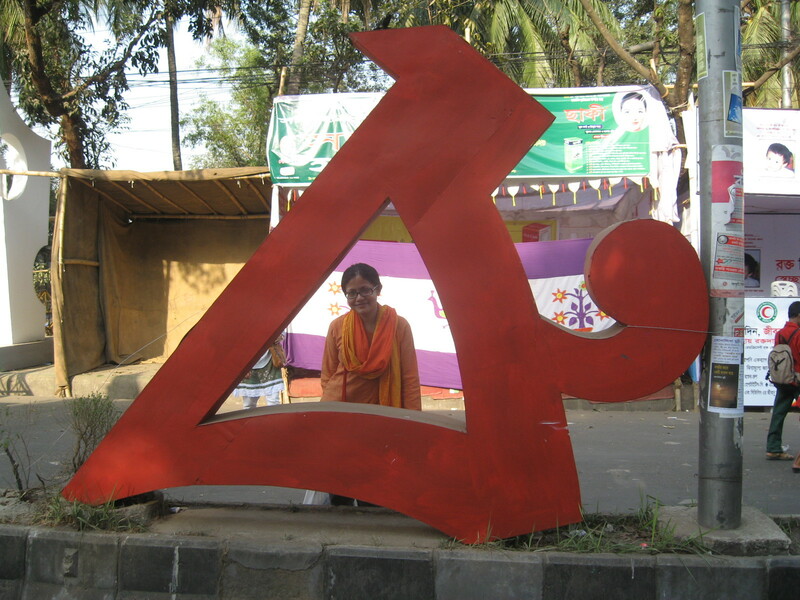 Keya pointed out, in hushed tones, that most of Bangladesh’s famous writers were wandering the grounds and signing autographs etc. Sadly, my dream of finding dusty hordes of antique maps and colonial relics was unfounded. These are struggling publishing houses, selling at discount rates. Most of the books are small, on low quality paper with few illustrations. However the range of books was vast and with Keya’s patient aid I came away with some treasure. I smiled as I saw the range of English books in translation. Mostly geared to students. And when I asked Keya which English writers she knew, I chuckled to think what sort of impression of England the young Bangladeshi students must have; Shakespeare’s plays written as stories, Sherlock Holmes, Jules Verne, Dickens, and Tin Tin. I also saw Dan Brown and Harry Potter. At one stage I was inteviewed for local TV, and on hearing that I was from London, several keen self-publishing authors offered to give me copies of their books to take back with me. I did take one; a hilarious comic story book with a not so subtle aim of teaching children about diarrhoea. 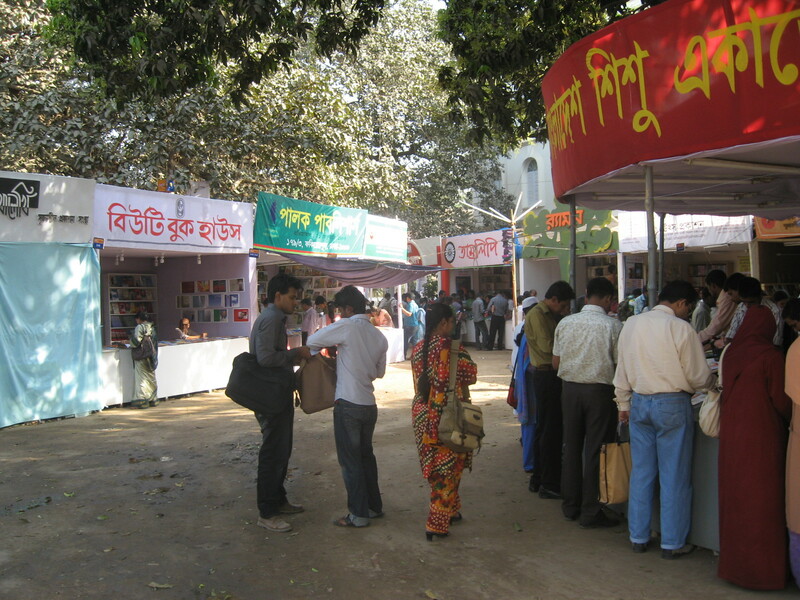 The Bangla academy pavillion was vast as expected but with a typically military style not conducive to browsing. Did buy a thick dusty book on calculus, as even in Bangla, the illustration/diagrams and greek notation make it intrguing to try and fathom. I will go back again on my own. 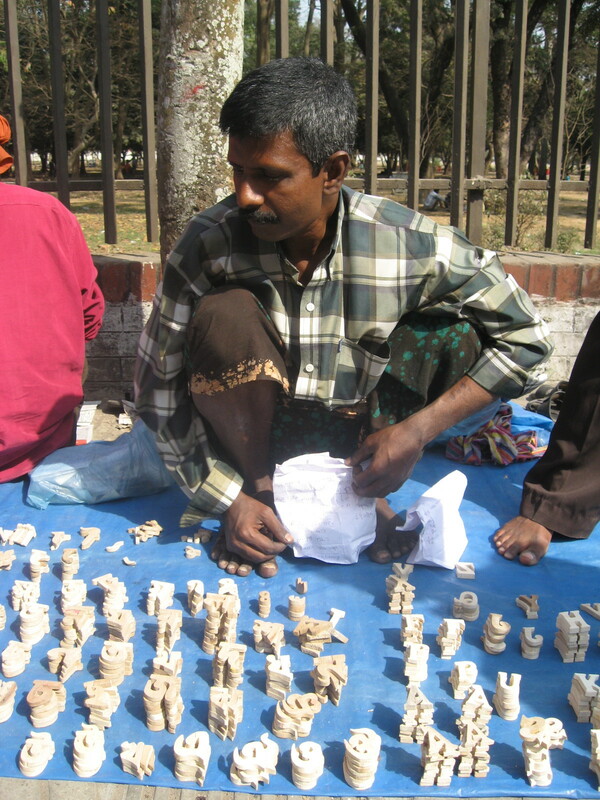 Was delighted to find a man selling wooden cut outs of the bangla alphabet. Bought a set to play with. Even more pleased with the paper bags he gave them to me in, which were made from recycled note books. They recycle everything here. 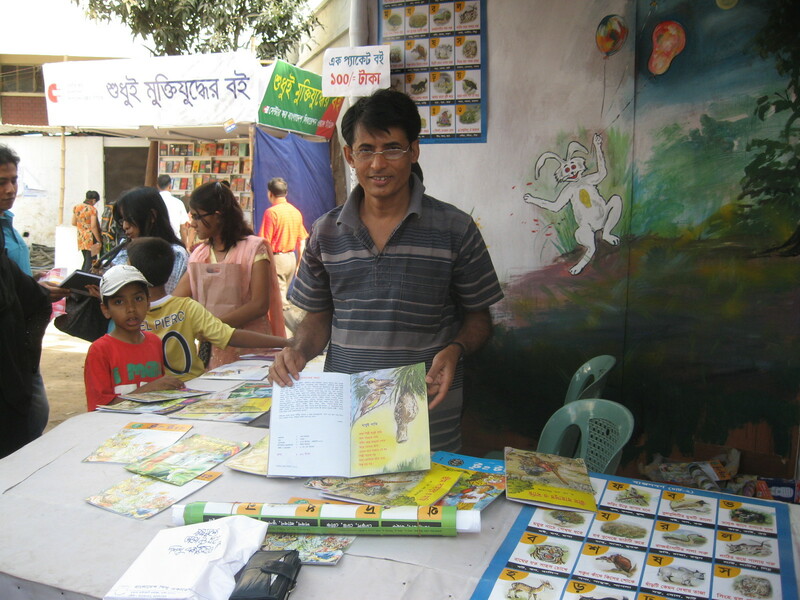 Will definately go back down to old dhaka to try find some more; have already got some made from text books but the hand written ones are really beautiful! Found it really frustrating not being able to read the titles of all those books. Would scan the covers, like coloured sweets, looking for ones that might be interesting, and was often most dissapointed by the translations. Similary, some classic, traditional Bangladeshi poetry and song books I bought had very unappealing covers. A lesson in not judging a book by its cover! Have no idea how I am going to get all these books back home, but will tackle that later. For now, am very pleased and head is whizzing with ideas and connections. Oh and also found some tiny clay crucibles in the jewellery quarter. Not sure what yet, but there is definately something to be done with them. Steven tells me they are made by children, each one being the size of a small thumb….